Pittsburgh, PA, November 29, 2012 – When asked to describe her holiday wish, Claysburg-Kimmel student Maggie Knisely, age 10, responded "Don't you wish it would snow boxes of peace and love?" 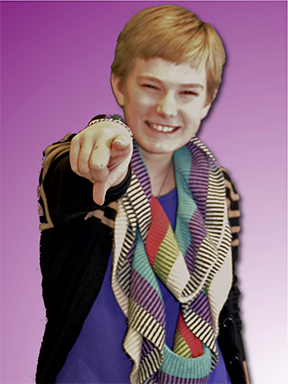 This season, Maggie will have the chance to inspire others with that wish through art. Maggie has been selected as winner of the 9th Annual Edgar Snyder & Associates "My Holiday Wish" Coloring Contest. As a winner of the contest, her holiday artwork appears on the law firm's holiday card. In addition, Edgar Snyder & Associates awarded her with a $100 gift card. Maggie's design features an outdoor winter landscape with boxes falling from the sky atop a snowman and evergreen tree. 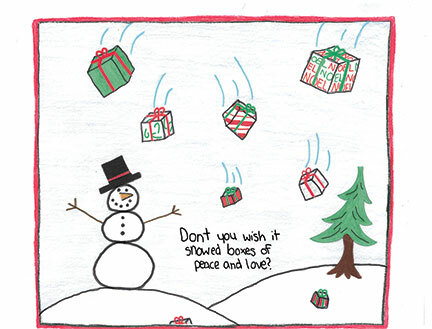 Underneath, it says, "Don't you wish it snowed boxes of peace and love?" Mrs. Jessica Miller, Maggie's art teacher, had the pleasure of surprising Maggie with the news. "When I told Maggie she was a winner, we jumped up and down a few times! I don't know who was more excited, me or Maggie! She couldn't stop smiling and I think she was definitely shocked!" Her class at Claysburg-Kimmel Elementary School was very generous in offering congratulations to Maggie. "The class was really, really happy to hear that Maggie was the winner and would be representing our school," said Miller. Maggie is a dedicated student who applies herself in all subjects and has a special love for art and creativity. At the encouragement of Mrs. Miller, Maggie reworked her original design at the last minute to be in a landscape format. Her hard work paid off. "I like to involve students in contests because it creates some competitiveness which fuels them to really go the extra mile and show off their artistic skills," said Miller. "They are really motivated to complete a project if there is a special prize or accolade, and it gets recognition for the school and the winning student." But Maggie is not the only one with a special wish for the season. "As a teacher, my holiday wish for my students is that they all take some time to reflect on how wonderfully blessed they are to possess their individual talents and unique character traits," said Miller. "…And to truly know and feel that they are all loved, valued, and appreciated by their friends, family and teachers." In addition to Maggie, four other students were recognized for their holiday submissions. Réka Götz, 9, of Marshall Elementary School in Wexford was the Grand Prize Winner. Edgar Snyder & Associates donated $1,000 to her school and awarded her with a $250 gift card. The three other runners-up were Bryson Huwar, 8, of Clarion-Limestone Elementary in Clarion; Emma Kraus, 10, of Paynter Elementary in Baldwin-Whitehall; and Carter Mates, 6, of Rumbaugh Elementary School in Mt. Pleasant. Each runner-up received a $100 gift card and their artwork appears on the Edgar Snyder & Associates holiday greeting card.